A constant challenge in food presentation is having the optimum consistency of sauces, whether savory or sweet. This gives stability and control of placement of your sauce, hence staying power and beauty in sheen and texture. Thinning is usually pretty straight forward. Just add the appropriate liquid, one that is compatible in both flavor and content; oil, sugar or acid base, until you reach the desired flow. The trickier techniques are in thickening. Two styles of thickening are cold and hot. Sauces, salsas, dressings…condiments and creamy things you don’t want to heat can be thickened with ease so that they stay where you put them on your creation or hold a peak. Line a tray with 8 – 10 layers of paper towels. Pour the sauce into the center of the pan and spread evenly to within two inches of the edges. You may need more than one tray to accommodate the volume of your sauce. Use your common sense. You will see the water or oil wicked into the towels at the edges. Let it rest a half an or more,depending on the difference between the initial thickness and the desired result. Once you are satisfied, scrape it off with a large spoon or spatula and place it into a bowl. Stir it gently to homogenize the thickness and texture. Now it is ready to use. Syrups, sauces, glazes and gravies… things that can be cooked can be thickened in several ways. The first way is to cook out some of the liquid by boiling it until it is the desired thickness. This does not work on egg based sauces such as Hollandaise, due to the butter content, which is very heat sensitive and requires special handling. If the sauce has a high sugar content, be careful not to boil it too long or it will become hard at room temperature. Use a thermometer to check your progress. Candy thermometers have thickness guides on them. Here is a handy chart that can also help if you don’t have a thermometer. If you want a pourable sugary sauce, don’t go above 230F’. If the sauce is too thick, add some of the unthickened sauce into the hot thickened batch and test again. If it is not thick enough you must cool part of the batch to incorporate more starch. If you add starch into hot liquid it will lump up and will be hard to incorporate smoothly. Strain out the lumps or use a food processor or blender to smooth it out and reheat. It won’t work if your sauce has bits in it that you want to keep such as bits of fruit, vegetables or herbs. There are some instant gel thickening products on the market that are even easier but have their limits, such as Simply Thick. Be careful of creating bubbles by stirring it carefully into a small amount of your sauce first, until smooth, then gradually and carefully add the rest of your sauce. No need for heating. It may sound complicated but it is just a matter of paying close attention. Several years ago I was introduced to Farro, an ancient Near Eastern grain, during a visit to my family in Rome. It is a delicious nutty grain that most other grains were bred from. Used in the ancient world long before and including the Roman Empire, it has come into vogue today in Europe and the USA with gourmet chefs and whole food seeking connoisseurs. It is often confused with Spelt, its close cousin. I had a gorgeous glass canister of bright orange lentils sitting on my counter begging me to make a great tasting, beautiful and healthy meal. I looked around my pantry and refrigerator and came up with an amazingly delicious, wholesome and hearty meal that feeds many for little money. You can omit the Turkey meatballs if you prefer a vegetarian dish, and will still have a high protein, balanced meal with virtually no fat. I named it Pernod Farro Lentil Melange. In a 6 quart lidded pot, soak lentils in water overnight in the refrigerator, or for at least 8 hours. Stir into the pot: tomatoes, onion, carrot, Pernod, apricots, raisins, bell pepper, hot pepper, mushrooms, basil, and about a teaspoon of salt. Bring to a low boil and simmer about one half hour. Stir farro into pot and continue cooking for another half hour. During that time, in a separate bowl combine shallot with vinegar, salt and olive oil. Macerate for about 15 minutes. Thoroughly mix ground turkey into shallot mixture. Using a one inch ice cream scoop, place meatballs evenly spaced onto a parchment lined baking sheet. Bake meat balls in a 375′ oven for 8 minutes. 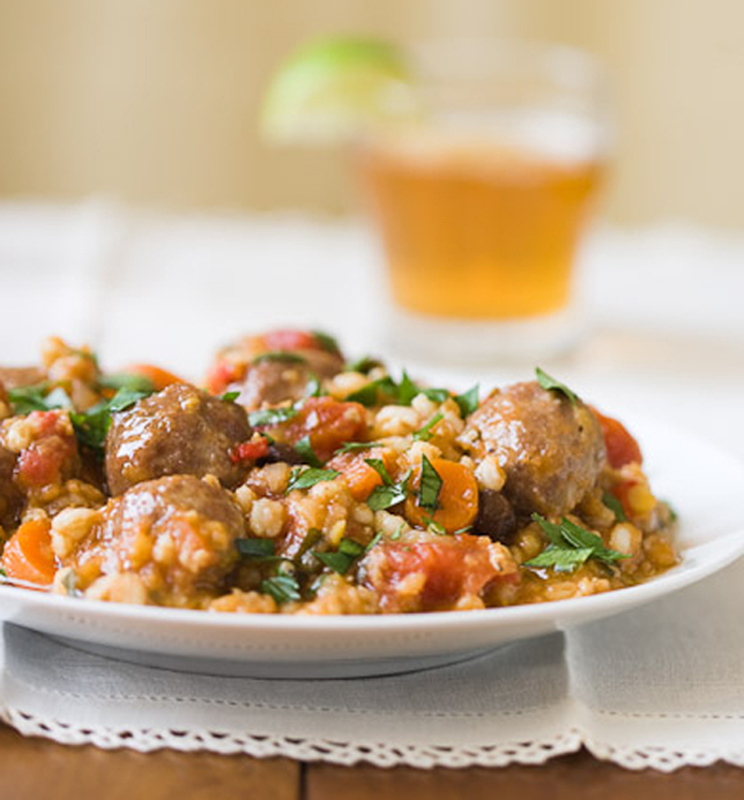 Add meatballs into the farro lentil melange. Taste for salt content and adjust to taste. Cook for another 1/2 hour. Mix 3/4 of the parsley into pot at the end of cooking time, reserving the remainder for garnish. Serve with English Ale & lime wedges.